Raith Rovers have added to their squad ahead of the trip to Stranraer on Saturday. The Kirkcaldy club have completed a deal to sign young Airdrie attacker, Willis Furtado, until the end of the season. The 20-year-old Ivorian, who has scored six goals in League One this season and can play either on the wing or up front, was out of contract and available on a free transfer. 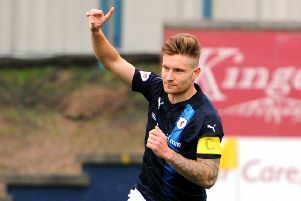 The move comes after Raith made a failed attempt to bring Aidan Connolly back to the club. The 22-year-old attacking midfielder, who spent successful five months at Stark’s Park under Ray McKinnon, had been expected to leave York City in the Janaury window but now looks set to stay with the Northern Conference side after winning his place back in the starting XI and scoring in midweek. Club owner, John Sim, was even prepared to put extra funds into the club’s January transfer kitty in order to secure what would have been a popular signing, but that deal now looks off.